A lot’s been written about the benefits of a dog carrier backpack. We’ve seen the evolution from teaching your dogs to heel, to taking them into the supermarket (surreptitiously), to carrying them in baby strollers, to carrying them on your back. Why would a person want to carry a dog like a baby? 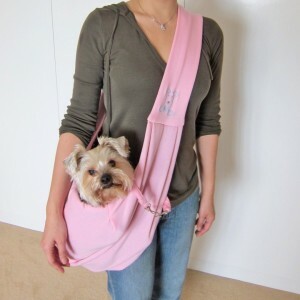 Besides the obvious reasons of wanting to have your furry companion with you 24/7 for the sheer joy of unconditional love, let’s look at some other possible benefits of a dog carrier or a dog backpack. If you’ve ever had the experience of caring for a lame dog, you know what it is to suffer disappointment or even heartbreak. I’ll never forget when my dog Bailey started to lose the use of his back legs. He had been a victim of abuse and neglect, and after he served in a court case as evidence against his owner, he was put up for adoption. I so wanted to give him the life he never had before, despite his advanced years. 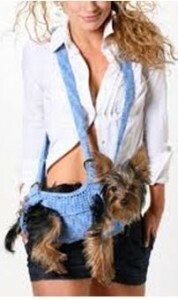 At that time, none of the fancy dog carrier backpacks were available. A contraption such as those would have made it possible for me to care for him a lot longer. At that time, there weren’t any packs that were ergonomically designed to mimic professional backpacker gear, which would have made it so much easier to carry a larger dog. It would have afforded him more freedom to get out and see things he had never seen before. When my dog, Lassie, went blind, I thought I would die of depression. I had to take a week off of college and spend time with her, recovering from the shock. But it didn’t take me long to realize that Lassie was not feeling depressed or “a drain on society” the way a human would. On the contrary, she still loved to run, jump, and dig for lizards in the woodpile. I was terrified that she would kill herself or poke her eye out because of what seemed to be reckless abandon, otherwise known as full enjoyment of life. Fortunately, she was good at following directions. 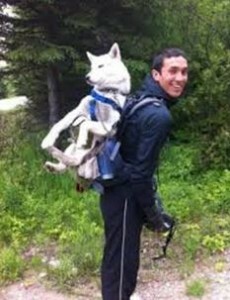 A dog backpack would have helped me take her with me into the hills where she loved to run. In the clearings and with a long leash in my hands, I would have had a lot more freedom to let her have the time of her life, especially considering that she saw no reason not to. Another obvious need is the arthritic dog who has a hard time getting around and enjoying life. 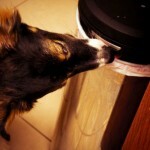 But this is also a good place to bring up the issue of comfort and design, both for the dog and for the owner. 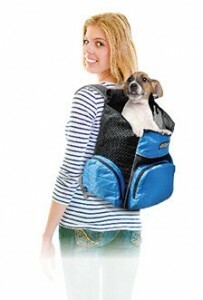 What Should You Look for in a Dog Carrier Backpack? I’ve examined the various shapes of dog carrier backpacks and broken them down into categories to help you select the right one for you. Category 1: Terrible for dogs. Your backpack may be a fashion statement, but your dog is not. Your dog is a live, breathing being with feelings and physical needs. Handling a dog in such a way as to disrespect the dog’s comfort is, in my opinion, unnecessary and insensitive. 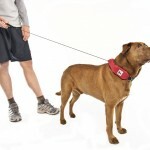 In Figure A, the carrier supports the dog by the belly. This is an unnatural position for a dog, which would always have all four feet on the ground when resting. He can’t rest his head this way. You wouldn’t hold an infant without supporting the head, and you shouldn’t hold a dog without supporting the feet. In Figure B, the carrier dangles the dog in an unnatural, uncomfortable position. In other words, the dog would never, ever treat himself like this – why would you? A dog’s digestive system requires that his body stay horizontal to the ground most of the time. This could also be uncomfortable for the tail, head, breath, or reproductive organs. In Figure C, the dog is in a completely uncomfortable, unnatural position. Maybe this picture was shot as a joke and only required the dog to sit like a human for a few minutes. I hope so. 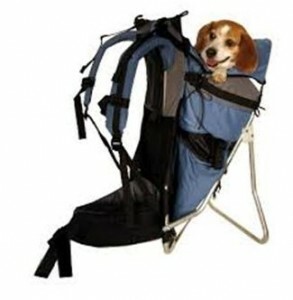 In these dog carrier backpacks, the dog is free to rest his/her feet on the floor of the bag or lie down at will. 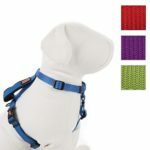 An added benefit is that the dog can see out; however, this could be dangerous for a dog who might be tempted to jump out. It can also spell liability issues if your dog jumps out and chases a cat or confronts a dog that might not be friendly. Zippered nets are great for safety, visibility, and ventilation. Click on photo to see specific reviews. When I was planning a six-week-long hitchhiking trip around Europe, I went to backpacking school to see how the sports hiker prepared for a long journey. At that time, I learned that the frame of the backpack can either cause stress on the back or work with the back’s natural shape to support a load without wear and tear on the hiker’s back. 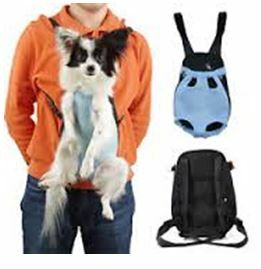 I was pleased to find some dog carrier backpacks that include good support for the dog and good support for the human, too. This may not be such a big issue for short trips, but can make a difference over time and in longer trips. Notice that the backpack itself looks a little strange until it’s actually being worn. Once it’s buckled into place, you can see that the weight of the pack is distributed to the hip area just under the small of the back, just where it should be for longer hiking trips. And the dog is free to jump up for a view, or lie down and relax. No matter what reason you have for wanting to tote along your best friend, the dog carrier backpack of your choice should make your life easier and provide more fun for you and your pet.